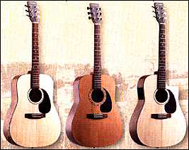 Our Acoustic Guitar section includes all the steel strung, acoustic guitars with and without pickup. Flat top 6 strings, Arch top 6 strings, Gypsy Jazz guitars and 12 strings. 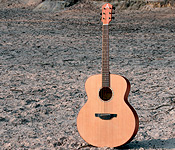 The steel string acoustic is suitable for most types of music except Classical and Flamenco. It has a slimmer neck than a Classical guitar and generally has lower action too. There are usually 14 frets from the nut to the body, and a cutaway body gives access to the higher frets beyond that.